Beat Your Redundancy Blues – Doing something Different – Have a Guinea Pig or Pet Party! When you are feeling down it’s a good idea to take your mind off things. One of the ways you can beat your redundancy blues, is to do something different and have a Guinea Pig or Pet Party! If you haven’t got pets, you could throw one for a neighbour or friend’s pet, with their permission. Or have a party for any kids you may have, or go out yourself and just have fun. I want 2015 to be the best year of your life. For you to achieve everything you have ever dreamed of. For you to stop believing you can’t and for to know you can! If you want to beat your blues by being your authentic, quirky self, no matter what, subscribe to my www.youtube.com/user/quirkybooksTV channel now! To watch more Embrace Your Quirky videos and start to lead the life, that only you were born to lead! Beat redundancy blues – Start living! Every so often, I like to share with you, one of my posts from my http://www.quirkybooks.wordpress.com blog, that I think is relevant to you. I wanted to share this with you because having been made redundant twice myself, I know how hard it can be and how depressing it can feel. Life does throw some spanners in our works and it can be difficult to see the light. In order to feel alive again, we must endevour to get back to living the life that makes us feel alive, regardless of previous circumstances or what works for others. Today is a new day, treat it as a new opportunity to feel alive. Thanks for all of your kind comments and support during this difficult time of my Grandma’s passing. Her funeral was yesterday and it went well considering it was a funeral. I read my entire poem without stumbling on my words. Being quirky, I made sure it was a funeral with a difference. I went around hugging everyone, including the people carrying the coffin, the guy playing the organ, the Funeral Director, the Vicar and all guests. I even had the Birdie Song playing us out of the crematorium. Me and my Grandma used to dance to that together and do the actions. I used to suffer with depression and thankfully I have been free of it for about two and a half years. I cured myself, and still maintain a good head through sometimes very quirky, unconventional methods. I am well aware that I have to prevent myself from going back to that dreadful place ever again. I believe life is for living, to the fullest. Although my Grandma has passed, in the rest of my life, I am the happiest I have ever been and so grateful to be living a young life. In my mind, I am getting younger and I love it. I believe in order to feel alive, you must start living. Do things that make you feel fantastic, alive, enthusiastic, excited and passionate, over and over again, and never stop. I live in my own quirky magic bubble and so long as I am in that, life is beautiful. My Grandma loved living a full and active life. Today is a new month and time for me to start living a new life. What wonderful opportunities will come my way? I wonder? After crying a lot this morning, this is the attitude I decided to take and I went to the cinema to feel alive and enjoy a part of my life in that moment. In my usual quirky Roving Reporter style, here is my review of Maleficent. It is less that one minute long. Enjoy it and let me know what you think. 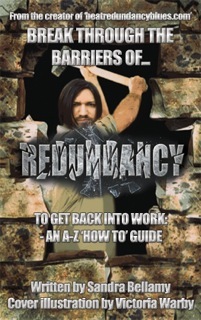 I am currently working on reformatting the interior of my Break through the barriers of redundancy book. It would seem that the CreateSpace templates have errors in them. One template I had 5 attempts to reformat and I had to scrap each one. Self publishing is hard but I am determined to publish my book.